The hottest thing happening at wedding receptions isn’t just on the dance floor — it’s on the wedding cake, the invitations, the centerpieces, and even the bride’s gown. It’s big, bold color. Years ago brides used color to accent their white wedding day decor, but now they’re using color to cover every inch of the wedding. When deciding on a scheme, you must consider the reception space or choose a space without decor or colour. If you’ve chosen a country club with navy and maroon Oriental carpets, a colour scheme of lime green and hot pink won’t work. Next, become aware of colour combinations that you like, whether browsing art galleries or flipping through a stack of fashion magazines. You might be able to narrow down your colour choices to a half a dozen. To help you choose the exact hue for your wedding details, visit a local fabric store or paint shop and collect swatches or chips of colours you might want to use. This will help you get specific, so that when you decide on green you’ll know if it’s lime green, kelly green, sage green, or forest green. If you have access to a Pantone book, use this collection of colours to select your shade the same way graphic designers do. Many invitation designers mix ink to match the colours in this book, and many cake bakers use Pantone numbers as a reference when creating dye for frosting. Can’t decide on just one or two colours? Don’t worry. In fact, many extraordinary weddings feature a variety of colours, sometimes up to five, that work together to create a specific sensibility. Where and how you use colour really depends on the mood you are trying to create. 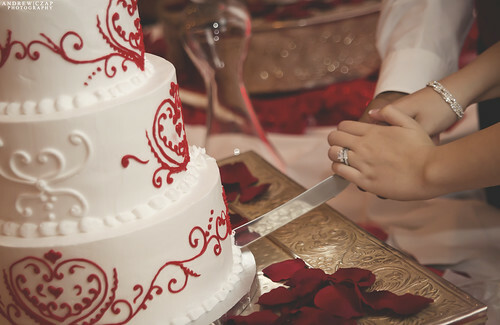 The best way to get started is to figure out what emotions you want your celebration to evoke. A peaceful, Zen-like retreat? A regal, romantic affair? A jumping, high-energy party? For instance, a vibrant summer yellow mixed with chocolate brown (think sunflowers and bees) is perfect for a country-chic wedding style; add gold to the mix, and the combination becomes more reminiscent of Northern Italy. As another example, leaf green paired with cantaloupe is pretty for a waterside wedding; but pair this green with copper, and you have a colour scheme that’s formal enough for a ballroom or an estate setting. If your wedding takes place in multiple spaces, each room can have its own colour scheme. Your gown doesn’t have to be solid white, especially since colour accents are increasingly more available. A blue or red sash around the waist is striking and still very bridal. The groom and his guys can also sport colour in their ties or on their cuff links. But colour will be most prominently displayed throughout the day in the bridesmaid dresses. Some fervent folks might want to match the dresses to the invitation ribbons, the favour tags, and the bouquets but this isn’t the only way to define a style. Mixing and matching dresses in varying shades — pink and orange, or pale green and yellow — can sometimes make a statement stronger than uniformity. Your invitations set the stage for the event, so remember that mood you want to evoke? This is your time to show it off. Coordinating the invitation colours with those of the wedding can be as easy as choosing a colour font, ribbon, or monogram or as elaborate as layering colourful cards. No matter what colour you’ve chosen, chances are you’ll be able to find flowers in that shade — but that, of course, does not mean the blooms will be available or affordable. If your dream flowers aren’t an option, use neutral white flowers with centrepiece containers or other decor elements in your colour. The cake is one of the easiest places to add colour — all it takes is the right mixing. The colour should reflect the other style elements used throughout the wedding. But when it comes to cake, your colour options are the most flexible. White icing makes a marvellous background for colourful sugar flowers, sugar-paste stripes or polka dots, or other effects. Fondant can also be created in any number of shades. For instance, a yellow and brown country-chic wedding might have a wedding cake iced in a light brown basket weave and topped with fresh sunflowers. Ultimately, it’s more important to give something meaningful rather than something that matches, but it can be a nice touch to your favours package in your colour scheme. Use gift tags and ribbons to incorporate your colours into your favours. If favours will be left at each place setting, consider how they will look with your wedding linens and flowers. We should point out that overdoing it with a matchy-match look is entirely possible. (You don’t want your guests thinking, Um, yeah, lavender…we get it.) Begin with the five essential wedding elements (attire, invitations, flowers, cake, and favours) and see where you can — or should — add more colour. Then consider details, such as napkins, candles, signature drinks, your ring pillow, or your guest book, made from the same fabric and in the same colour as the bridesmaid dresses.